The one millionth Porsche 911 ever manufactured won't be coming to Canada as part of its world tour, but the 999,999th 911 was sold here. The Guards Red 911 Targa 4 GTS that came down the automaker's Zuffenhausen facility production line — right before the millionth car — was delivered to Pfaff Porsche in Vaughn, Ont., just north of Toronto, the dealership said on its website. 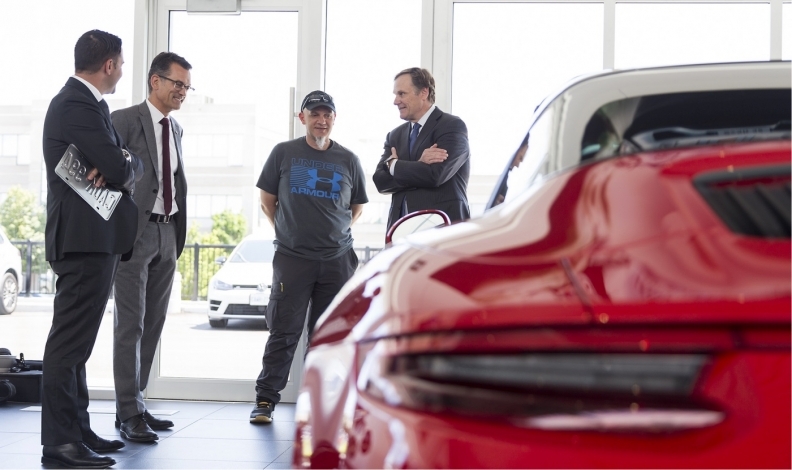 Owner Rob Tenuta received the car in a special ceremony, during which Porsche Cars Canada CEO Alexander Pollich joined salesperson Alex Krigos to complete the transaction. Tenuta received some special gifts to accompany his special car, including a Porsche desk pylon anodized black like his 911 Targa 4 GTS’s roll bar, which is traditional silver, and a special certificate from Porsche. The one millionth Porsche 911 rolled off the line May 11. Porsche outfitted the Carrera S in “Irish Green,” to mark the occasion. It also gave it a custom interior, a mahogany rim on the steering wheel and a couple nods to the one million number, including a badge on the dash. Porsche will not be selling the 911, however. Instead, it will embark on a worldwide tour before being sent to the Porsche Museum. Porsche Cars Canada spokesperson Patrick Saint-Pierre confirmed to Automotive News Canada the historic car won’t be making its way to Canada as part of the tour.